On Saturday and Sunday, August 22-23, 2009, we drove the length of Washington State Route 27, meandering through the farms and hills of extreme eastern Washington, from Pullman to Spokane. Plus, we got to see a parade! 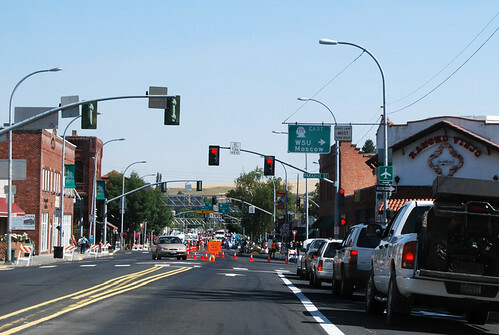 Two miles south of milepost zero in downtown Pullman, SR 27 begins where US 195 takes a left turn to avoid the city. 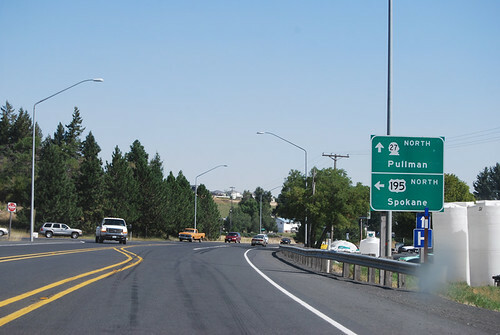 As we arrive in the heart of Pullman, we meet the eastward junction with SR 270, which will take you past WSU to Moscow and the University of Idaho. But wait, what are those traffic cones ahead? 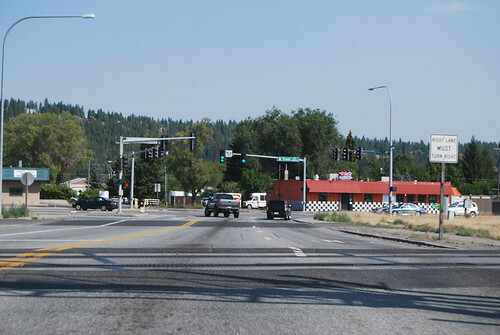 A couple blocks later, SR 270 departs SR 27, heading westward. The road ahead is blocked. A parade seems to have taken over the road. . . 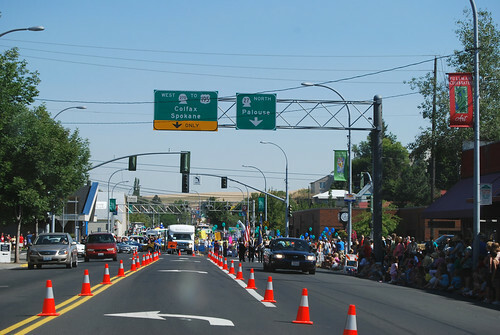 It's the National Lentil Festival Parade! Hurrah! We therefore hunted for a parking spot and spent an hour and a half in Pullman, watching the parade, walking around, shopping yard sales, etc. Eventually, though, the small-town junior misses and the classic tractors and the WSU football team and the WSU marching band and the gymnasts and Sponge Bob Square Pants and the bagpipers and all the rest cleared out of the road and we were able to proceed northward on Highway 27. 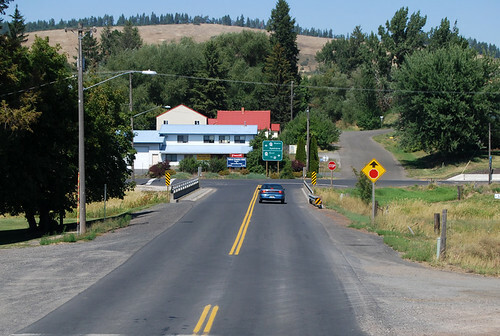 Several miles up the old Inland Empire Highway, now the Palouse Scenic Byway, through the rolling farmland of The Palouse, we arrive at the city of Palouse. 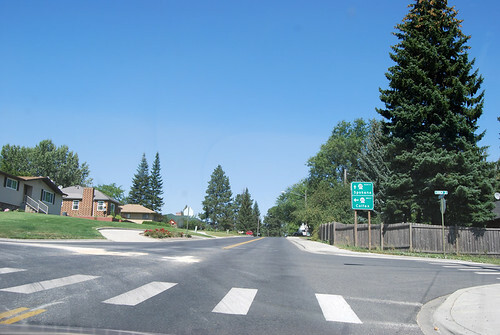 Therein, a junction with SR 272 that will take you eastward to Idaho. A few turns through town later, we arrive at the westward departure of SR 272. . . . The photos in the towns always make this region look more wooded than it actually is. You can tell when you're approaching a populated area because you can spot the trees ahead. 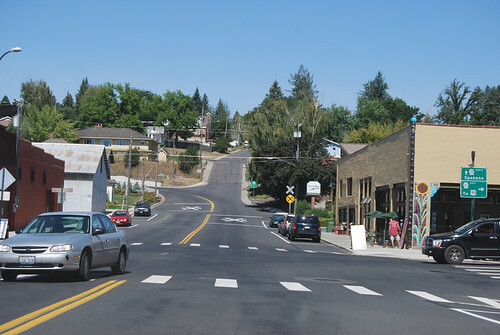 After passing through Oakesdale, you must take a right turn to stay on SR 27. Otherwise, you'll continue straight on SR 271 (which is the original route of the Inland Empire Highway). Throughout the length of Highway 27, the signs continually direct you west to US 195 or east to US 95, because if you're actually trying to get somewhere in a hurry, those are the two roads to take. 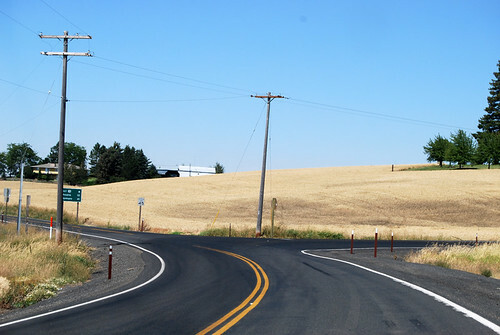 Highway 27 just zigs back and forth all over the countryside. 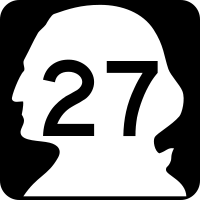 In the town of Tekoa, Highway 27 intersects SR 274, such that you must take a left turn to stay on 27. The highway enters town zig-zagging generally northeast, but leaves town heading west. With all the turns, it felt like we'd gone in a full loop and we'd no doubt intersect the highway we'd already driven! After passing through a stretch south of Fairfield that the new AAA map shows as a dirt road (The AAA map from a few years ago shows it paved, though! 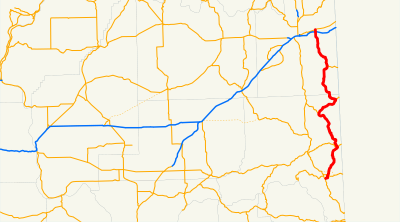 ), we arrive at Rockford and a junction with SR 278, which Google Maps doesn't show as a highway and doesn't even say "278" at all unless you zoom way in on Rockford. 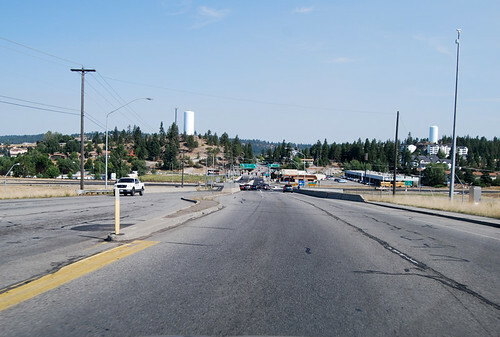 This is odd, because the combination of 27 and 278 (and Idaho 58) are the fastest way to get from Spokane to points south on US 95. 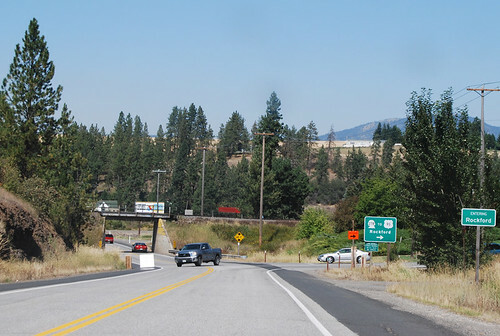 Highway 27 loses most of its signage after I-90 and becomes known as Pines Road. Hey, look over there! I did an interior renovation project in that building! And then, finally, unassumingly, unsigned, we arrive at the end of Highway 27. Its final junction: SR 290, better known to the locals as Trent Avenue. And so there it is, Highway 27. Not the fast route through the region, certainly, but a fun drive, with all its twists and turns and gentle hills. Or, as Chunlin put it, "This road is crazy."